Go ahead and test the waters. Waterproof socks are a bit on the nontraditional side of wet-weather cycling accessories. The minds of the uninitiated are filled with images of unbearable clamminess and spongey feet. But they'd be wrong. 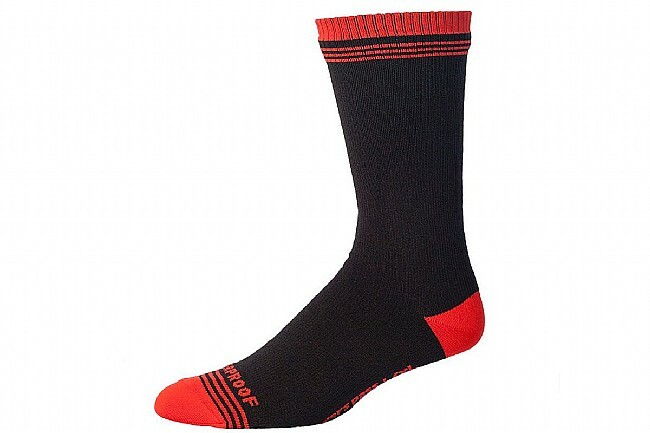 Showers Pass's Crosspoint Socks might just change the way you train during the wet season, or at least, change how you feel about getting out there when it's coming down. These waterproof / breathable socks feel like normal socks thanks to a durable knit exterior and moisture-wicking antibacterial Coolmax FX liner. Sandwiched in between these two layers is the real workhorse, the Artex waterproof membrane that'll let your feet still breathe while keeping out rain and road spray so well that you'll be shocked how warm and dry you are at the end of your ride. Great fitting socks plus they keep your feet dry!! They even breath and are comfortable. I would recommend. I wear these when it's below 45o even if it's dry out there. They have great insulating properties in addition to keeping your feed warm but no damp mustiness! At first I thought they be too thick to fit in my winter cleats but no issues. Love these! So i purchased these socks with high expectations. However my experience was not what I had hoped for. I rode 6 miles with no fenders, my shoes are fizik M3B without shoe covers, and it had rained heavily 1 hr. prior to start of my commute to work. The street was very wet but no rain in the said 6 mile commute. End result not waterproof. Highly recommend these socks for cold or cold and wet weather. The fact that they have three layers solves all the problems, and keep you feet warm. I have issues with cold feet below 40 degree F, and these socks worked well today for a 65 mile ride at 32 degrees F.
It does its job!! Keeps the water out!! Used it for a hiking trip and keeps the water out in ankle deep water! I would buy another pair!! I haven't had a chance to really test them on a seriously wet ride but in a light rain they work amazing. My commute is about 45min and they kept my feet warm, dry and comfortable. I was skeptical at first but was a believer when i tested them under running water in the sink. They seem a bit bulky compared to other cycling socks but fit in my riding shoes without a problem.